The mold isn’t a stain. Instead, it’s a living thing, embedded in your drywall. Plus, it causes chemical reactions with paint that changes the color of the paint. When you wipe off the top layer of mold with a cloth, you’ll notice that it seems to have sunk into the drywall. The mold and spores there will re-grow and spread, and if you cover them with thick paint, they will just eat the paint. What About Mold Resistant Paint? New mold resistant paint has hit the home stores. But, why isn’t it called mold proof paint? Well, because the manufacturers of these paints know that no paint will keep mold covered forever. Hours, days, or weeks later, the mold will re-appear. The best use for mold resistant paint is to coat healthy, uninfected drywall. 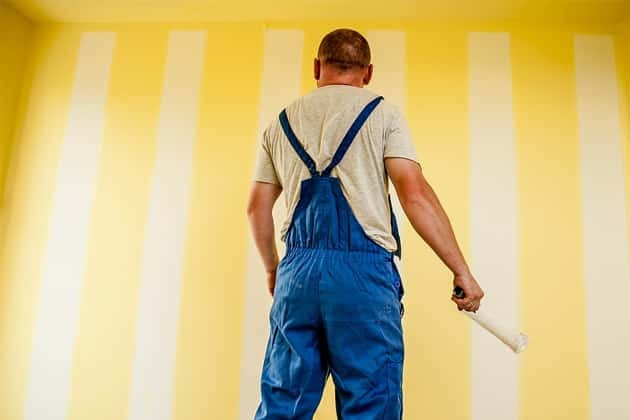 This high-acidity layer of paint can help you keep mold from developing. You’ll also need to clean and dehumidify a space that is vulnerable to mold. Still, if mold has already developed, the paint can’t remove it from drywall or kill the spores underneath. Mold exposure can cause health problems, especially for those who have preexisting respiratory issues such as asthma, allergies, pneumonia and chronic pulmonary obstructive disorder (COPD). New research suggests that mildew exposure may increase the likelihood a child develops asthma. Black mold may even be toxigenic. Toxigenic molds can, though rarely, cause very serious health issues and even death. That’s why it’s important to have mold managed by professionals, who can identify the type of mold your property has been infected with. If you’re a landlord or property manager, painting over mold without addressing the cause may open you up to liability. A tenant can argue that you put their health at risk by not resolving the mold. Plus, if you get the mold resolved properly, you’ll spend less time answering tenant concerns, painting and re-painting, and running a dehumidifier. Long-term mold solutions are more cost-effective than painting over mold in the long run. Professionals should have many solutions you can choose from. Overall, calling a professional mold removal company instead of painting over mold will save you money and limit any harm the mold might cause you or your tenants.